The beautiful, streamlined Hudson for 1950, the only car with the “step-down ride” and Hudson’s exclusive “Monobuilt Body-and-Frame,” the forerunner of today’s Unit-Body construction. This was a big, roomy, low center of gravity road machine, and one of the most elegant cars of its day. 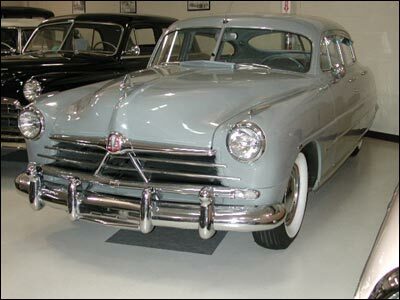 Remember the movie, “Driving Miss Daisy?” Morgan Freeman chauffeured Miss Daisy in her 1950 Hudson Commodore 8, just like this one. The Commodore 8 was the forerunner of the Hudson Hornet, which dominated the Nascar races from 1951 to 1954. In 1955, Hudson and Nash Merged to form AMC, now part of Daimler Chrysler.